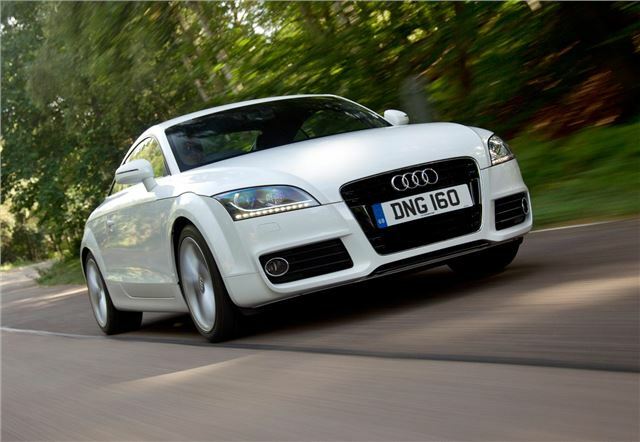 The Audi TT is now available with the 1.8-litre TFSI petrol engine from the cabriolet version, dropping the entry price for the TT range to £24,070 on the road. The 1.8-litre engine is available in Sport and S line models with both six-speed manual and seven-speed S tronic gearboxes. The turbocharged unit provides a reasonable 160PS and 250Nm of torque. Top speed is 140mph and 0-62mph takes 7.2 seconds with the manual or 7.1 seconds with dual clutch automatic. It’s a reasonably frugal engine, too, delivering 44.1mpg on the combined cycle. Equipment levels remain the same as the rest of the TT engine range – sport models get 17-inch alloy wheels, electric climate control, leather/Alcantara upholstery and a Concert audio system with iPod/ MP3 connectivity. S line models get LED running lights, larger 18-inch wheels, lowered suspension and S line exterior and interior details. The TT Coupe 1.8 TFSI in Sport trim costs £24,070 with a manual transmission and £25,550 with an S tronic transmission, while the S line manual and automatic models are priced at £26,060 and £27,540, respectively.